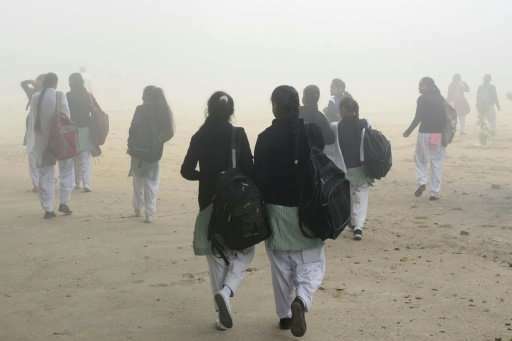 Angry parents accused Delhi authorities on Monday of "playing with children's health" as schools reopened despite a fresh surge in pollution to emergency levels. Doctors declared a public health emergency last week when choking smog descended on the capital and elsewhere in northern India, prompting authorities to close schools, ban construction and bar trucks from entering the city. On Monday authorities reopened schools amid concerns over upcoming exams, angering some parents. "There has been no let-up in the pollution levels. So if the situation is the same, action should be the same. Why open the schools now?" said Ashok Agrawal, president of the All India Parents Association. "On one hand the government is saying there is a health emergency and on the other they are playing with children's health. "It is so disturbing to see children coughing and struggling to breathe all the way to the school." On Monday levels of PM2.5 topped 500. The smallest and most dangerous particulates penetrate deep into the lungs, increasing the risk of heart attacks and strokes. The World Health Organization says 25 is the most anyone can safely be exposed to over a 24-hour period, and levels over 300 are considered hazardous. Doctors say children are particularly vulnerable to air pollution and this can cause long-term damage to their lungs. One 2015 study found that four in 10 Delhi children were suffering from severe lung problems. "It is a fact that children are particularly vulnerable and more affected by pollution than adults," said Ajay Lekhi, doctor and president of the Delhi Medical Association. "They breathe more air per pound of body weight, so their exposure to air pollution is much greater," he told AFP. A report in the Lancet medical journal said pollution had claimed as many as 2.5 million lives in India in 2015, the highest in the world. Large swathes of north India and Pakistan see a surge in pollution at the onset of winter, when farmers burn crop stubble following the harvest. The cooler air also traps particulates close to the ground and prevents them from dispersing—a phenomenon known as inversion. In Delhi, local industry, coal-fired power plants and a growing number of cars on the roads have worsened the crisis. The state government last week announced restrictions on private car use from Monday, but the plan collapsed after India's top environmental court objected to exemptions for women, VIPs and motorcycles. It was expected to appeal the court's ruling on Monday. Delhi is now the world's most polluted capital according to a WHO survey conducted in 2014, with levels regularly exceeding those in Beijing. Pollution monitoring authorities have said the situation could improve later Monday as winds strengthen.